Betty Woodman, Table and Rug, 2016, ceramic and paint on canvas, 180x157x30 cm. American artist Betty Woodman began making work with clay in 1950, producing functional pottery objects which were gradually enriched by her deep relationship with painting and progressively developing over time into a study of interaction with space, both real and pictorial. Her work combines lacquered ceramic and painted canvas to make free-standing and wall-mounted three-dimensional works with a bright and inventive use of colour. Betty Woodman (b. 1930 in Norwalk, United States) has spent the past forty years living and working between Tuscany and New York. Her extensive career includes a retrospective at the Metropolitan Museum of Art in 2006. In 2016, Woodman had an exhibition at Salon 94 in New York, an exceptionally well acclaimed solo show at the Institute of Contemporary Arts in London titled ‘Theatre of the Domestic’, and a large outdoor installation commissioned by the Liverpool Biennial. 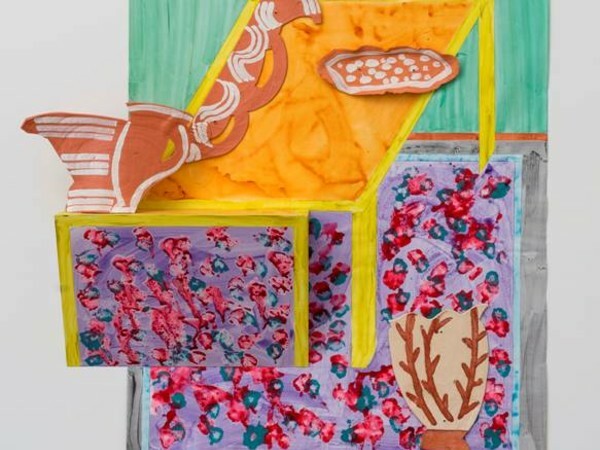 In the 1970s Betty Woodman opened a second studio in the small hillside Florentine town of Antella where she still lives and works.